Plus, and the threads are lovely and subdued. I'm in a bit of a quiet space at the moment...thinking about big things and dreading next week. Mom will have been gone thirty one years on the 12th and Stewey has been gone two years on the 14th. Maybe it's the weather or the lull before the holidays, but this time of year is...melancholy. I suppose my pod mate's passing has made me stop a bit and contemplate....slow down and remember and miss what once was more than ever. The temperatures have finally fallen enough that I closed the windows and almost turned the furnace on. I didn't, and will continue to play my game to see how long I can go before doing so, but I think the second floor factor is weighing in my favor since the thermostat hasn't fallen below sixty yet! Chili for dinner tonight. I was somehow smart enough to freeze portions the last time I went on a cooking frenzy, so I have good options for nights that I need something fast and easy. If my energy level allows, I might try to channel my inner Ina on Saturday and make a few more things. I'll be making needleminders again tomorrow. I am making the dotted hearts and might try some holiday colors. A stitchy friend has requested some for gifts, so I thought I might play around and see what I can come up with. If you are looking for the coffee cups or other styles, my sister is selling them in her etsy shop: SiggysCloset. I suppose that's the full report and enough ramblings for a November Wednesday. I'm off to the chair in a few minutes...armed with my stitching and lots of Outlander to catch up on. I have two episodes from the previous season and the premier of the new to watch, so the time should fly. Happy Futzingday to you, Dearies. Do something wonderfully fun and come tell me all about it! Gilded Cage is very pretty! Are you using the suggested thread colors? I'm about to start two new projects. I've been wanting to stitch these for ages, so now is the time, since I'm getting caught up (well, sorta, kinda...better than I used to be!) on WIPs/UFOs. 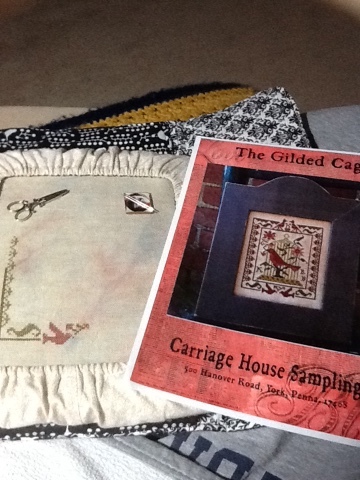 Both are from very old cross stitch magazines, so I'll have to scan the photos to show you. One is Christmas (the angels announcing the nativity to the shepherds), and the other is a very different scarecrow. Treat yourself gently, Coni. Gentle, Quiet, Comfortable -- those are words to remember. You and yours are in my prayers. Will the needleminders work as just regular fridge magnets? I'm not a stitcher but I would like to help you out. They are very cute! Yes, indeedie! They work very well as fridge magnets! Stay tuned! A shrink I know has a favorite saying: be kind to yourself. I am trying to incorporate this into my self talk. I think you have another winner with your new project!!!! Enjoy the new start Coni. the new start looks great and I do so love reading your blog. I agree this is the time of year for reflections. Robyn Sydney Aust. Good stitch choice for the new start, Coni! Hope you enjoyed your chili dinner! Thinking of you! Thanks so much for letting us know about your sister's Etsy. Just bought my sister a coffee cup one for Christmas :) She is going to love it!